The Lightning Chassis Co. offers the following range of Dirt Chassis to cater for the wide range of requirements Dirt Karters request. 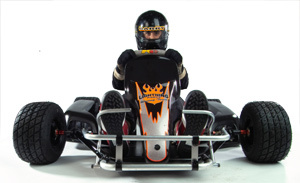 Ranging from the rookie class up to the 200cc Open class each kart is designed and manufactured using the latest techniques and best materials. Lightning have been producing chassis since 1992 and during this period they have continually developed them to the standard they are today. They have won numerous State and National titles over the years and continue to lift the bar to higher levels every year. Lightning chassis incorporated their innovative concepts and components. Often copied but never matched their build quality ensures that they provide years of competitive use. Components are both strong and light to enable the kart to both perform and take the punishment that the world of auto racing delivers. As with all Lighting chassis, a majority of the components are interchangeable across the range. Items such as stubs, front bumpers, steering columns are the same on all chassis, making spare parts easier to find. Only items such as floortrays, rear bumpers and some pod bars vary from model to model.